The Player Menu My Login Preferences brings up the dialog to let you set your preferences for your use account. 'Remember me on this Computer' - turn on or off appearance of you name in the list at startup and login on this machine. When you turn off 'Remember me on this Computer' your name will not appear in the list. 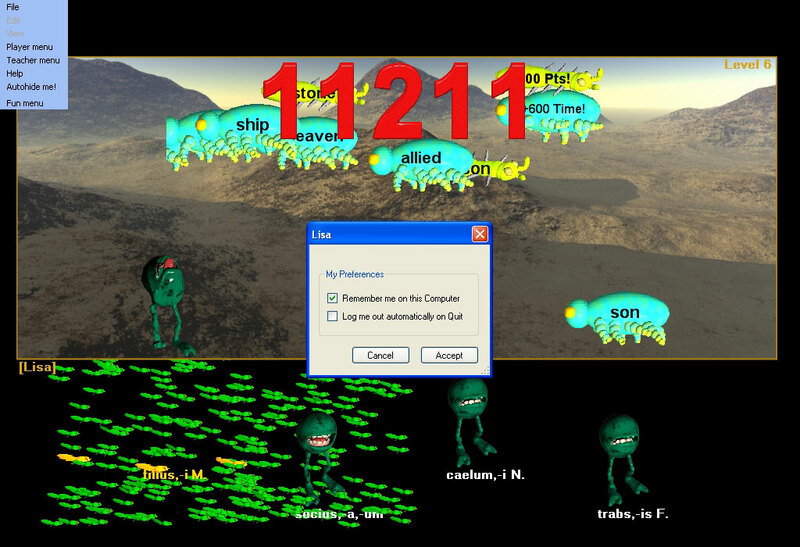 If you have 'Remember me on this Computer' checked and 'Log me out automatically on Quit' checked, then your name will appear in the Hungry Frog Player Login screen every time you start the game and the Hungry Frog Player Login will appear when you restart the game after you quit. Your selection of 'Log me out automatically on Quit' means that when you quit the game you log out, and as you are quiting not just switching users during the same game session, you will log out and the game will exit with no player logged in at all. Hence, the appearance of the Hungry Frog Player Login screen at the next game start. If you have 'Log me out automatically on Quit' UN-checked and quit the game, then when you logout YOU WILL REMAIN LOGGED IN WHEN THE GAME RESTARTS. The next time you restart the game (or anyone else restarts the game) your account will the active player account and the game will start where you left off. NOTE: Single users on one computer can un-check 'Log me out automatically on Quit' and un-check 'Remember me on this Computer' and the program will behave as if it were only for one player and had no multi-user login/logout. You can quit and restart the game and the game will pick up where you last left off with no dialogs in between. See the Player Menu | Login / Change User pages for details.